JLE - Phillips Murrah P.C. 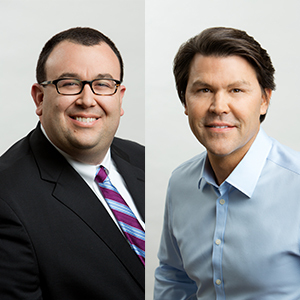 Tom Wolfe, managing director at Oklahoma City law firm, Phillips Murrah, announces that attorneys Joshua L. Edwards and Jim A. Roth have been elected by the firm’s shareholders as new directors. Edwards and Roth’s appointments were made effective January 1, 2014, bringing the total number of directors in the firm to 29. Mr. Edwards is a corporate attorney who represents clients in a broad range of commercial transactions, including private securities offerings and venture capital financings, mergers and acquisitions, real estate transactions, and commercial finance, with an emphasis in the healthcare and life sciences industries. His practice includes regularly advising healthcare leaders in an array of transactional and regulatory matters. Mr. Edwards assists clients in developing strategies for successfully closing business deals as well as maintaining compliance in an increasingly-complex and ever-changing regulatory environment. Mr. Roth is a former Oklahoma Corporation Commissioner and Chair of the firm’s Clean Energy Practice Group. He represents a number of clients in their natural gas ventures as well as assisting them in the development of Oklahoma-based wind-energy farms and other new clean energy initiatives. Roth said, “I’m proud to be on the Phillips Murrah team because this firm is the best strategic partner to help clients achieve their success.” Mr. Roth is at the forefront of new clean-energy technologies and is an advocate for expanding these burgeoning industries in Oklahoma. As a frequent writer on the policy decisions at both the state and federal levels affecting new types of clean energy, he ensures clients are aware of future implications of their clean energy aspirations. [ SEPTEMBER 2010 – OKLAHOMA CITY, OK ] – The Oklahoma County Young Lawyers Division officially kicked off its 2010 Harvest Food Drive by successfully raising over $4,200.00 during its Second Annual “Strike Out Hunger” Bowling Tournament held on August 12, 2010. The OCBAYLD would like to thank all of our participants and the following sponsors for helping to make this event a huge success: Andrews Davis; Beale Professional Services; Chesapeake Energy Corporation; Crowe & Dunlevy; Fellers Snider; Foliart Huff Ottaway & Bottom; Hall Estill; Hartzog Conger Cason & Neville; Kirk & Chaney; McAfee & Taft; Nelson Roselius Terry & Morton; Phillips Murrah, P.C. ; Pierce Couch Hendrickson Baysinger & Green, L.L.P. ; Rex Travis & Associates; Rubenstein McCormick & Pitts and Tisdal & O’Hara, PLLC. The funds raised by the Strike Out Hunger Bowling Tournament are contributed towards the OCBA YLD’s Annual Harvest Food Drive fundraiser. Funds raised during the Harvest Food Drive benefit the Regional Food Bank of Oklahoma. Once again, the OCBA YLD has a goal of raising $20,000 and would appreciate your support. The OCBA YLD Board Members are now seeking donations from Oklahoma County law firms, individuals and organizations. The Regional Food Bank of Oklahoma is a non-profit organization which distributed 36.5 million pounds of food and products to hungry Oklahomans in 53 central and western counties in 2009 alone. Since its inception in 1980, the Regional Food Bank has distributed 321 million pounds of food and product across Oklahoma. For every dollar donated, the Food Bank is able to return over $14 worth of food to the community. That equates to 7 meals for each dollar! If you or your firm is interested in making a donation for this worthy cause, feel free to send your donation directly to the Oklahoma County Bar office. Donations are tax deductible and make a huge difference in reaching the $20,000 goal and contributing to our community in need. No amount is too small. Phillips McFall announced the addition of five new attorneys to the Firm. Joshua L. Edwards, Wendy P. Higgins, Carol E. Sorensen, Myron K. Stout and Lauren L. Symcox were named associates in various practice areas, including litigation, health care, banking and patents and trademarks. Each attorney brings special talents to the firm, including 16 years of banking industry experience, previous experience as a patent attorney and years of community service experience. Phillips McFall was pleased to announce the addition of five new attorneys to their Downtown Office: Joshua L. Edwards, Wendy P. Higgins, Carol E. Sorensen, Myron K. Stout and Lauren L. Symcox. Edwards and Sorensen join the Business Department, Higgins and Symcox will focus their work in the Litigation Department and Stout adds to the ever-growing Intellectual Property Department. Phillips McFall congratulates and welcomes its newest attorneys. 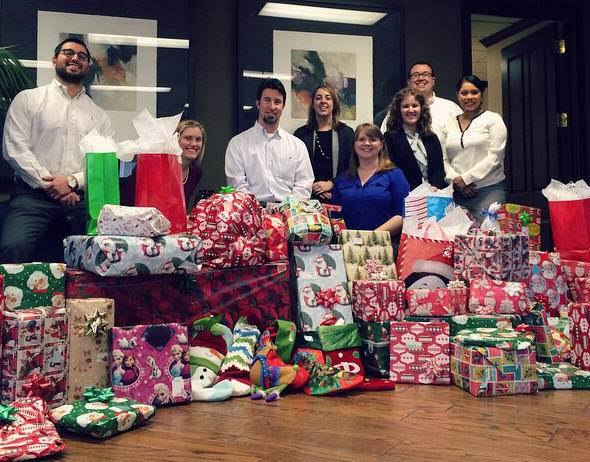 Jennifer L. Miller, Dawn M. Rahme, and others gathered around the Board Room table to wrap presents and give gifts for the Firm’s Adopt-A-Family charity. Started in 2005 by both Miller and Rahme, the duo and friends were featured on Christmas Day 2007 in The Oklahoman for their generosity. Other helpers included John L. Shears, Carol E. Sorensen, Laine E. Baker, Joshua L. Edwards, Bonner J. Gonzalez and Andrew S. Mildren.